Today we’re bringing you not one but three iconic North East landmarks: contemporary art gallery the Baltic, the Millennium Bridge and the River Tyne. 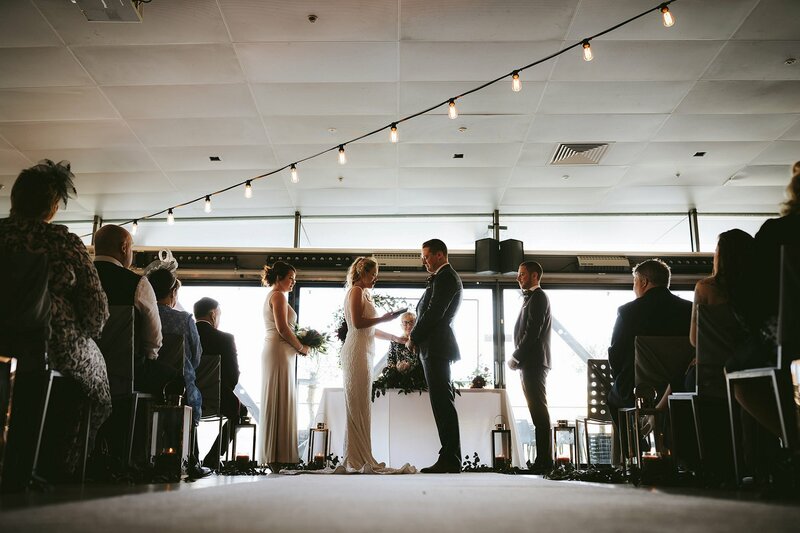 Combined, they create the super stylish, urban backdrop to Jessica and Connor’s big day last October. The setting of their second date – the Baltic ticked all the couple’s boxes and then some, thanks to its fabulous riverside location and terrific views. And it comes as no surprise to us that the overarching theme for the day centered on the city of Newcastle! As foodies at heart, we simply must draw your attention to the couple’s creative catering – a family-style roast dinner, create your own ice cream sundaes and over 200 cupcakes, brownies and blondies. Delish! Jessica says: Connor and I had only been together for a year when we went on holiday with his parents to Elounda in Crete. Connor and his family had been visiting family friends there since he was a baby; it is like a second home to them. When he told me that he wanted to go for a drive up into the mountains so I could see the view I didn’t think anything of it. When we got to ‘the spot’ there was already a photographer there, and so Connor insisted on waiting for him to leave while I watched the goats being herded in. Connor secretly filmed the whole thing, telling me to get into frame for a photo. The shock on my face says it all! And he nailed the ring: yellow gold with a sapphire and diamonds. We knew we wanted an autumn wedding as we didn’t want a long engagement and the following summer was too soon. 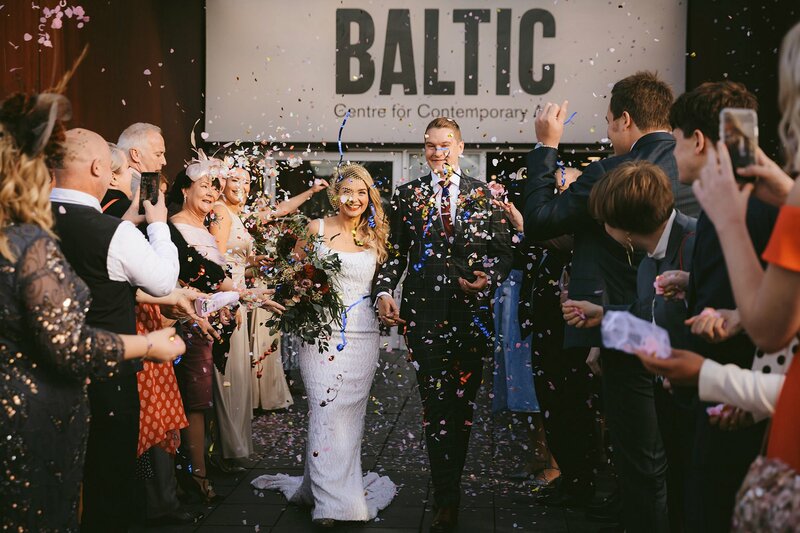 Once we’d seen the Baltic, we knew that’s where we wanted to get married and 27th October 2018 was the only date they had in our autumn timeframe to host the full day. 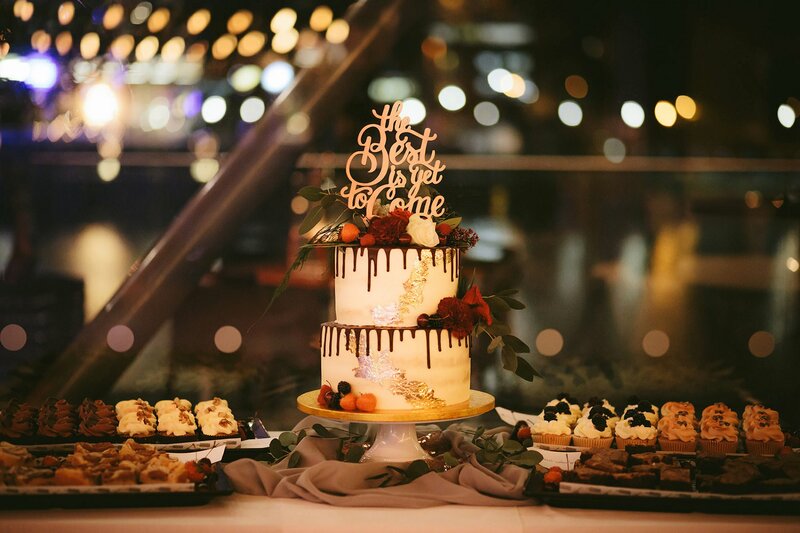 We knew an autumn wedding would give us the colours and detail we wanted, and as the venue allows you to be inside all day – the autumn weather wasn’t really an issue. The Baltic is just wonderful. We had our second date there and, a year later, we were revisiting with a coffee from the Sunday Quayside market when I saw posters advertising their wedding services. I pointed them out to Connor, saying it would be amazing to get married in our place. At that point I didn’t know he’d already bought my ring and was waiting to propose! When looking at wedding venues we wanted contemporary and a short distance from the city centre. Neither of us are from Newcastle, so we wanted to make sure that friends and family could find accommodation and travel easily. The details available at the Baltic were breath-taking and we were so excited at the potential of the spaces available. 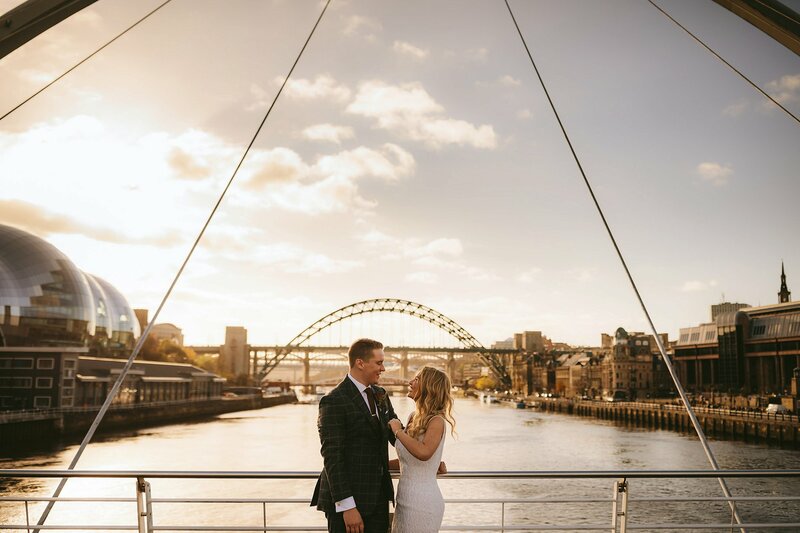 We could get married with a view of the Tyne and have a fizz reception with a view of the city. The offer of a cinema room and generous open space was also really attractive to us. My father-in-law created a video to show in the cinema room, where he had edited a slide show in which all our married guests had submitted their marriage advice and wedding pictures. In the empty gallery space in between the rooms, Connor’s friends organised ‘the 50p game’, one of their party traditions, and got everyone giggling in cocktail hour. If we did have a theme, it would be Newcastle! The Quayside in Newcastle is our favourite place, and so we asked my close family friend, who is a talented artist, to spray paint the Newcastle skyline as a backdrop for photo booth selfies on the day! We also had an alternative guestbook that had a small map of the Newcastle bridges to our house in the centre, and guests signed around that. It’s now pride of place, framed in our hallway. I trained as a modern foreign languages teacher, so the tables were all named after untranslatable words about love in different languages. My favourite was “Drachenfutter: a gift or some other form of peace offering used by a husband or boyfriend in order to appease an angry woman or girlfriend.” It was a fun injection of something personal. We just chose things that meant a lot to us, which I’d say should be the theme for any wedding – the couple’s interests and likes. For colours, we wanted classic, not trendy, as I didn’t want anything that would date quickly. 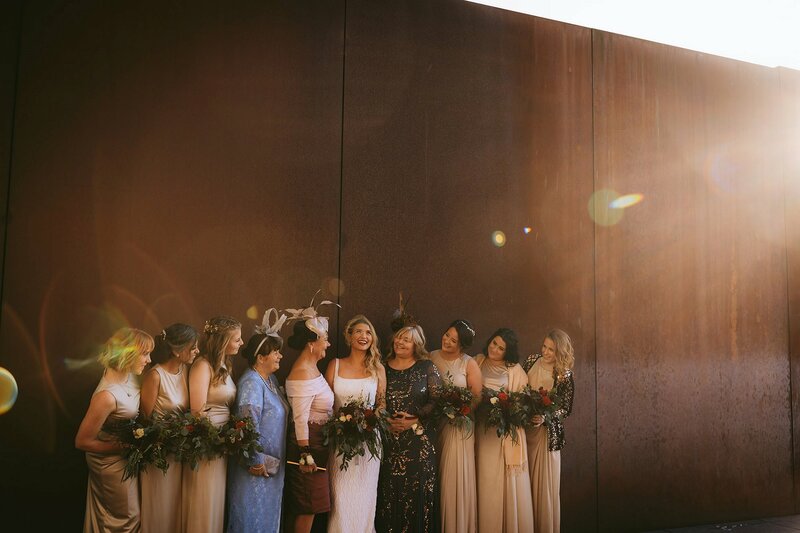 We love autumnal colours, and picked up on gold, bronze, and deep reds for the day to blend in with the venue rather than competing for attention in such an iconic place. When it came to choosing a dress, I found the whole process a bit overwhelming! There’s so much choice, and no one looks like the models on Pinterest in real life. I also found the price tags unbelievable. I tried on some beautiful dresses when I went shopping with my mum, grandma, and sister but eventually chose a vintage dress I took a gamble on ordering from an Etsy store in America! The dress was a column silhouette, with a train, and the detail was an intricate geometric pattern made of tiny white glass beads. Even better, an absolute bargain as it was second hand: vintage 1960s. Any savings made on having a vintage dress were put towards the Jimmy Choos I chose for the day instead – it’s all about balance! 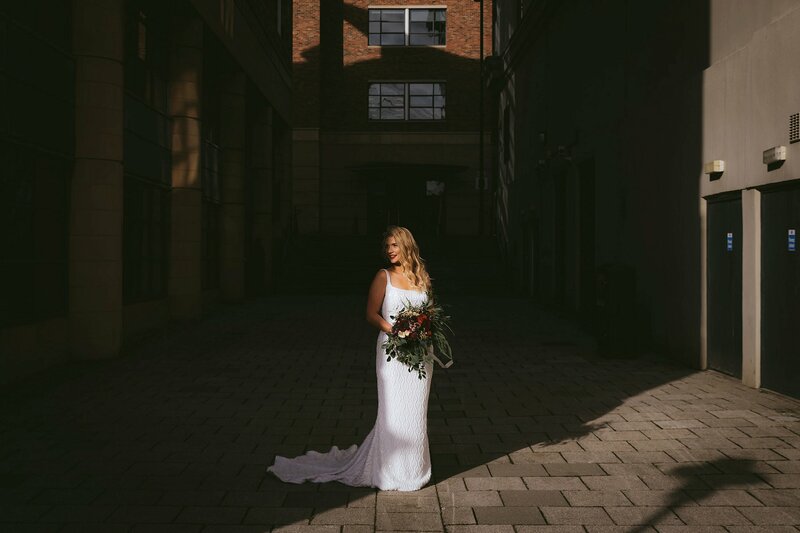 Leigh Hetherington Bridal did my alterations as I wanted the back lowering to give the dress a more contemporary feel and make it entirely unique. Her work was flawless, and it was impossible to see the alterations. I didn’t want a veil and so when I found What Katy Did Next I fell in love with her vintage vibe and commissioned a custom slide with a gold birdcage veil. It was so intricate and stylish without getting in the way or detracting from the detail on my dress, which was what worried me about a veil. Connor had complete control over what he and his groomsmen wore. He bought his suit from the Moss Bros outlet on eBay so he could find the right sizes, but the main focus was his shoes! Connor met Simon, founder of the Hand Dyed Shoe Company, when working with him on LinkedIn. He’s based locally near Durham so we travelled to his workshop where we were blown away by his story and craftsmanship. The shoes are stunning and have our wedding date on the left heel. For Connor’s wedding ring, his mum and I coordinated having some of his grandparents’ gold jewellery, including his grandmothers’ wedding rings, made into a custom gold wedding band as a way of remembering them on the day. Amblergem Jewellers in Newcastle melted down the ring and it is a beautiful, unique colour and so precious to us. The groomsmen were left entirely to Connor to sort, although when it got to August and he hadn’t found anything I did start to worry! He was holding out for the right look, which he found in autumnal burgundy suits from Next. They wore their own choice of black tie, belt, and shoes so that they didn’t incur any extra expense and so they could stay comfortable. They looked very suave on the day. I found my bridesmaid dresses after a personal shopper appointment at Debenhams with my sister. The dresses were Phase Eight, and were modern, comfortable and versatile so my girls could choose their own accessories and colours for makeup. They all have such different looks and yet looked so together and absolutely stunning; my sister said I found the holy grail of dresses. Through trawling Instagram hashtags and stalking weddings at venues I liked, I found Mink Studios. Ashleigh assured me they would treat my big bridal party (ten in total!) like an efficient assembly line, which is exactly what I wanted. She and her team were so relaxed, so patient and so talented; we were all thrilled with the results. It’s especially impressive when you consider that everyone chose a different hair and makeup style. They are fabulous! The boys just got an Uber to the venue, very low key! The bridal party were staying and getting ready at Malmaison, just a short walk across the Millennium Bridge from the Baltic. My dad was so excited about walking me across there, he’s a bit of a showman! We were just praying for good weather which we got lucky with – cold, but dry and sunny. One of Connor’s groomsmen is a photographer and said if he was getting married he would have Nigel John. Nigel’s style makes everything look like stills from a movie; he’s so talented. We are so lucky he was available! His eye is so sharp, and on the day he never missed a detail. We cried when we saw the moments he’d captured. Ruby Tuesday, a florist and decorations company based in the North East, did our flowers and decorations from the bottom up. Karen is so personable and has such great ideas! We didn’t want any fuss over the favours, and so we incorporated Ferrero Rocher into the name cards on the tables. I’m originally from Pontefract, the home of Haribo and liquorice, and so we gave out small bags of sweets with a tag saying “with love from Pontefract”. For more fun, on the tables we organised a bet on how long the speeches would last! I chose a Games Master to look after the timings, and everyone had a laugh guessing who would speak and for how long. My beautiful, talented bridesmaid Beth of Beth’s Kitchen made my wedding cake and more than 200 cupcakes, brownies and blondies. I kept the brief quite vague as I entirely trust her opinion and she knows me so well! The cake was a crowd pleaser, with a tier of lemon and a second tier of raspberry-white chocolate, and then she had fun with the tray bakes! The biscoff blondies and blackberry Eton Mess cupcakes were particular favourites. Connor and I both like hearty, unfussy, good quality food. As we had quite a lot of people for the day and we wanted a relaxed atmosphere we opted for sharing food, serving a roast dinner, family style which was absolutely delicious. Our wedding planner let us order off menu to serve build-your-own ice cream sundaes for dessert with fun and tasty toppings. The chefs served everything from candied nuts, to autumn fruit coulis, to smarties! The evening meal of fish finger butties or veggie burritos went down a treat. I loved that we had such fun food! We love soul and Motown and saw Funk Conspiracy in a local pub when we decided that we needed them to perform at our wedding. We chose the full seven-piece band, and they had everyone up dancing all night! They also provided a DJ service after their set, which kept us dancing until past midnight. Everyone has commented on how great they are, and so low maintenance with planning! I was so pleased that so many people met us for drinks the night before the wedding and stuck around for brunch the day afterwards. It was such a special time and everything we did was with our wonderful friends and family in mind. We were quite traditional in wanting something old, new, borrowed and blue. My dress was my something old, and I also wore my great grandmother’s eternity ring; my headpiece and shoes were new; I borrowed my mum’s teardrop diamond and gold necklace, and Connor bought me sapphire earrings. For his present I bought him a pack for the morning: socks, underwear, Tom Ford cologne, a miniature Laphroaig whiskey, and a hip flask. I can’t recommend the Baltic and the Fresh Element team enough. If you want a versatile space in an iconic location with the most attentive, professional, friendly team then I don’t know why you’d go anywhere else! Walking over the Millennium Bridge to the Baltic was actually one of my favourite parts of the day. The groomsmen had asked pedestrians to stay to one side and so loads of people had lined up to take photos which was so surreal! As we reached halfway, we heard cheers and saw our guests on the balcony of the reception room, which was amazing! I totally lacked elegance, waving back like a madman! It was so lovely, so exciting, and an amazing build up. My best friend and Connor’s groomsman, Phil, delivered a reading to open the ceremony, which set everyone off crying. Our mothers rounded the ceremony off, as they delivered a joint reading, which involved bringing soil from their gardens for a juvenile tree, which is now in our garden. We had also written our own vows, and it was unbelievably emotional to hear the similarities in our promises. Connor definitely regrets promising to make coffee in the mornings though! My dad, Connor, the best man and I all did speeches, which people note as the highlight of the day! I wasn’t allowed to hear Connor’s speech, and my mum had warned me that my ex-squaddie dad couldn’t get through his without crying. After such beautiful words, it was so funny that after such poignancy the best man was hijacked by our fathers, who said that if his speech was inappropriate, he’d be swimming in the Tyne, giving him a life jacket and opening the door just in case! The quiet moments that Connor and I took to watch everyone enjoying our planning are points I’ll never forget. We loved watching everyone have fun and joining in letting our hair down to finally get drunk in the evening while dancing. We left two days after the wedding to travel around Sri Lanka for ten days, taking trains, buses, tuk-tuks and taxis all around the south of the island. We saw elephants, blue whales and the most stunning views we’ve ever seen. The last three days were spent in Dubai, which was a good way to readjust back to a life where palm squirrels can’t get in through the roof. I have two tips for other Brides (and grooms!) Up North. Firstly, trust your vendors, as they are the ones you need to make your day run smoothly. Don’t stress over things they can sort for you! Secondly, don’t take yourself too seriously in the run up. The vows are important, and as long as the legal part is booked everything else is a bonus. Everyone is there because they love you, and they might appreciate your expensive, bespoke perfume but that’s not going to be their overriding memory of your day. They’ll remember the feelings, and how much fun they had, and how much you love each other. Don’t lose sight of that in the madness of planning. Also, throughout my engagement (and a little before!) I followed the real wedding features on Brides Up North, loving how every couple makes their wedding their own. I love the features on the site and the Instagram posts too, which is genuinely a bride’s best friend. Love this wedding!! That cake is amazing! !